I’m so glad you are enjoying the yoga course; as Cathy said are you really putting in 66 hours each week? that is amazing commitment. Your vase is gorgeous. I so admire your elegant style that I would love to emulate. Yes, learning a lot from the yoga pursuit Christina. There are not 66 hours of contact time/week but outside time includes, studying and preparation, journaling, etc. Very pretty, the Orchid is the perfect contrasting touch. Thanks, that orchid has been blooming for a long time and was beginning to fade, so thought it would be nice to use it here. Thanks Eliza, this design seemed to create itself. Enjoyed working with the colors. The yoga training has been fantastic. Learning so much. You balanced both the space and the colors beautifully, Susie. 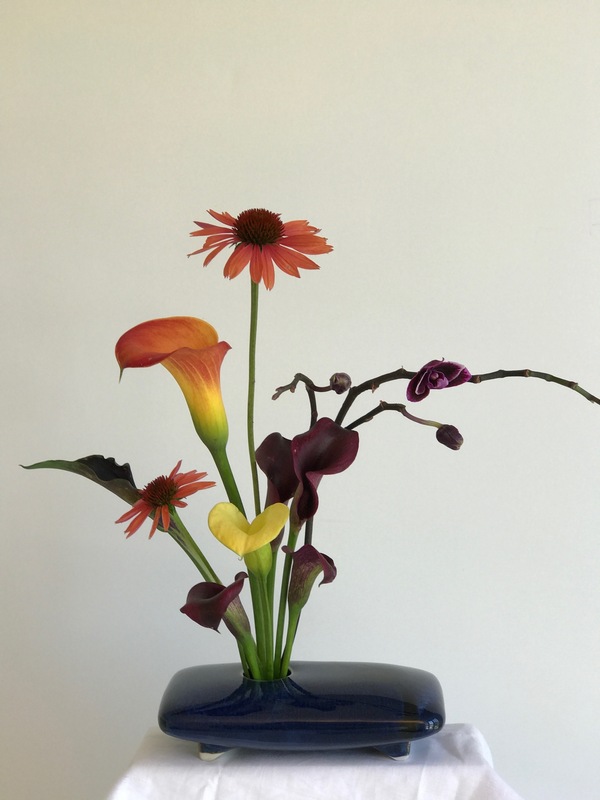 Your garden produces on an entirely different schedule than mine – my calla lilies are long gone and cone flowers are just now becoming available locally (not that I find it possible to grow any of the latter in my own garden). Thanks Kris. Wish I could share some coneflowers with you. We’ve had so much rain they are thriving this year. I would not think to put these colours together but your arrangement is stunning. I love dark coloured flowers but the oranges really lift them. Hi Alison. Must admit the package label of this calla lily blend inspired using the deep plum with the orange. I like the richness of those colors. This arrangement is elegant and very Zen, but so rich in colors. Perfect! Thanks Pris, Enjoying working with calla lilies for the first time. They lend themselves to this type of design. It is truly stunning Susie – and that vase is sublime. I have to say, though, the thought of cutting that orchid stem would make me weep! I guess if you are really into Ikebana there’s a higher purpose there? Good luck with what sounds like a pretty heavy yoga programme. 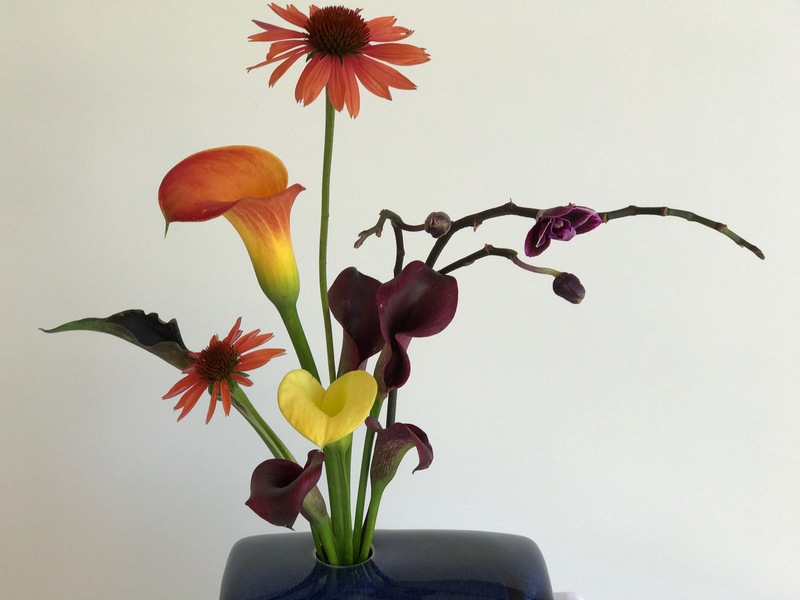 Your vase may be reflecting your mood this week? Cathy, the orchid had been blooming a long time and recently began dropping several buds, so decided to salvage it this way. 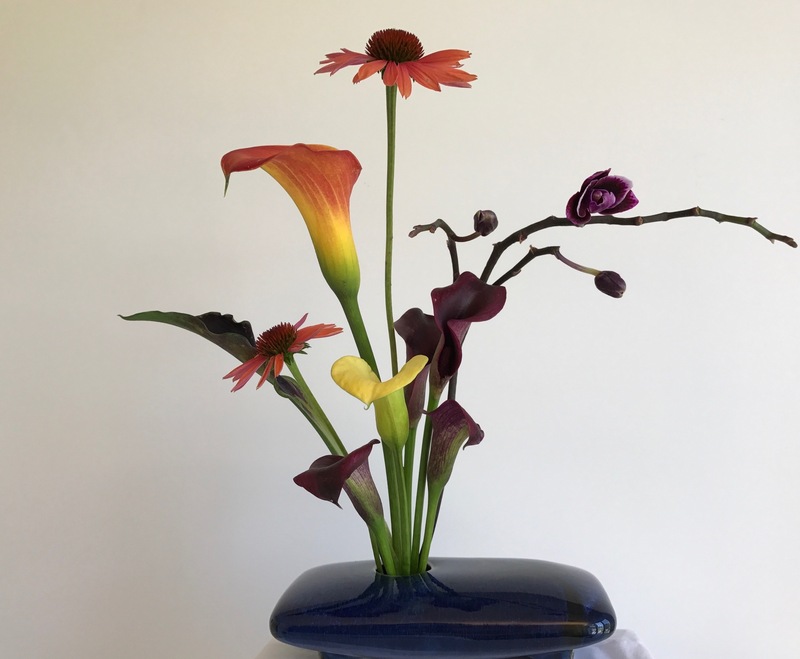 I should think more deeply about what draws me to Ikebana but one thing I like is it takes so few flowers and is rather quick to achieve a design. Thanks for your supportive words about the yoga. Training is going well–quite a stretch for me but rewarding. So I won’t mourn the orchid too much. Allow yourself to be drawn perhaps? You are clearly a deeply thoughtful woman and there’s something about that style that’s a ‘fit’ for you. I applaud what you are doing! Again – hope the yoga going well (the ‘stretch’ I understand!). I love yoga, but fail to live up to my own daily expectations at the moment! Yes, interesting observation Cathy. The training is a challenge, but fun. Oh how elegant that is Susie. You do have an artistic eye, your arrangements are always so well balanced and beautiful. Thanks Liz, this design fell together quickly once I got past trimming away those nice long stems on the callas to fit the height I needed. Oh dear just beautiful like you! Thank you. Glad we’ve met!